Board a glass-bottom boat in Cabo San Lucas and watch the colorful fish and other marine life swimming beneath the vessel. 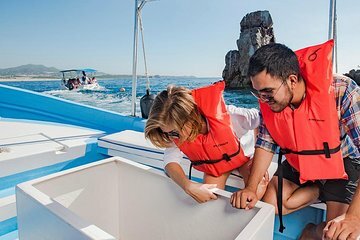 This 45-minute boat ride takes you to Los Cabos’ main attractions: the Arch, sea lion colony, Lover's Beach, Pelican’s Rock and more. Spend time shopping or lounging on the beach, with the option to catch the shuttle back to your hotel whenever you'd like. The tour was very short and the boat was not really easy to see the fish underneath. The arch was pretty and enjoyed seeing the sites from the water therefore I gave it a 3 star. There were fees we had to pay to get on the boat that were not covered in this price. The Arch is a beautiful journey and a must see. The excursion did not do what it says. The trip out by boat is about 45 minutes. There was no beach time, as said. Half of us were dressed to snorkel, and thought we had signed up for that tour. There was no lunch offered for sale, as said. They drop you off in the San Lucas shopping area and can choose 3 or 5 hours to shop. Could have done all this with a water taxi and a 2 fancy bus ride. Just the right amount of time less than an hour to see the arch and lands end. Didn't expect more from the tour. Saw lots of fish and a school of bat rays. Pretty cool. I would use this trip to check the arch off my list of things to see in Cabo.